Monalisa finished college 2st year few days back. In her home, they had to daily braid Monalisa in college days as she had long hair. So they planned within all members that Monalisa should be given short haircut. Some suggested she can be given shoulder length haircut. But her mother suggested she can be given be boy cut hairstyle so that we need not comb her long hair. They hinted at this idea to Monalisa who like her long hair very much. Monalisa argued she wont cut her hair. They scolded her for not agreeing for haircut. After a lot of aruguments, her mother told morning 10 am, we will be going to parlor for boy cut hair of yours. Monalisa saw her over mirror and seeing her long hair finally. Monalisa went with her mother to a ladies beauty parlor around 10 o clock. She didn't speak to her mother on that day as she was fed up of losing her long hair. When they went in, Monalisa hands were shivering thinking about haircut and how she will look after. Two seats were there. One girl was being given eyebrow threading. Another girl was trimming her hair. Monalisa asked she too would trim and leave the parlor. By that time, threaded girl left the parlor and Hair dresser asked what needs to be done for this girl.Her mother said,cut it short like boy cut. Monalisa started to cry as she had no choice .Hair dresser asked very short boy cut or medium boy cut. Her mother said medium boy cut. water on her thick and long hair. Her mother said she should look like boy when she gets down.Hair dresser said don't worry she will be shortened as much as possible. Hair dresser made Monalisa neck to bend down. Monalisa was crying down with tears. Then she took scissors.chick..chick..chick..The sound of scissors heard by Monalisa was making her shivering. Hair dresser made her ponytail half the length. Within 2 minutes,She gave two ponytails cut from her long hair to mother. Her mother smiled and took it in her bag. Monalisa had her hair up-to shoulder where she had her ponytail tied previously. She had her bob cut hairstyle now .Monalisa said to Hair dresser please leave like this, i am ok with bob cut, don’t cut it too short. front and started to cut her front loose hair. Then Monalisa was made to turn left side and Hair dresser clipper-ed her side burns and her ears became visible. She was turned to right side and her hair was shortened around ears.Her mother came near the chair and said it keep this thickness and trim it at ends. hair and made it straight like boys back hair. 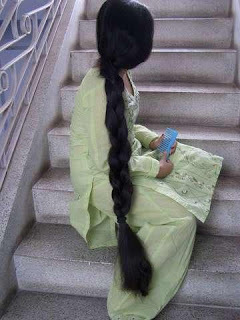 Then she came front and started combing her hair front and cut the length and made some hair to be shown in the front. Then she was shortened at her ears both left and right. Her mother came near the chair and asked could you remove the hair on her face? Hair dresser said, shall i do threading? No, can you shave her side burns and face. Monalisa said please leave me, i don’t like shaving my face. Her mother said, if you don’t like shaving your face, she will shave your head. Monalisa said please shave my face. Then Hair dresser took a razor and started shaving her side burns around her ears. She made Monalisa head to lie on the chair head and started shaving her face. Monalisa felt the pain of razor on her dry skin. She was totally humiliated in the process. Then Hair dresser applied powder on her visible neck and shaved face. Monalisa finally got down and felt her short hair with her hands. Her mother paid 100 rs to Hair dresser and Monalisa's visible neck with boy cut was seen by everyone on the way to home. She started to enjoy her short haircut finally after few days.